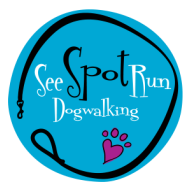 Welcome to See Spot Run, Calgary's most established dog walking company! Founded in 2008 See Spot Run has been dedicated to putting the health and wellness of Calgary's dogs as its number one priority. Services include daily pack walks with free pick ups, and drops offs from a location of your choice, an hour long walk/run at one of Calgary's designated off-leash parks, water for hydration, and various toys to keep things exciting for your active critter. And of course all under careful supervision of myself Acara Kada, an experienced dog owner and lover! Please check out my profile and gallery to get a feel for your dogs future walking experience, and feel free to contact me to set up daily, weekly, or one time walks for your deserving pet. "A Social Club for Dogs"